The StaffordMall invites and welcomes contributions on any and all Stafford-related subjects from owners and fanciers around the world. Please email Terry or Carolyn Stewart. Use this feature to search StaffordMall.com. 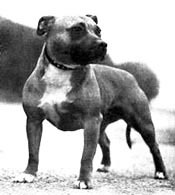 There are over three-hundred (300) pages dedicated to the Staffordshire Bull Terrier. Search for a person's name, name of a Stafford in your Stafford's pedigree or a keyword(s) of a subject you wish to find on this site. Welcome to the StaffordMall, the Staffordshire Bull Terrier site that spans the international Stafford scene. We offer up-to-date news, insider's scoop and feature articles by eminent breed writers on myriad subjects, including the history, breeding, training, feeding, care and conditioning of the Staffordshire Bull Terrier. Among our some 200 pages of material, you'll also find dozens of pedigrees, interviews with Breed veterans, and insight into the best people dog on earth. Enter StaffordMall.com and discover "One of the finer things in life" - the Staffordshire Bull Terrier. -- come join the fun! Visit our rescue/re-home page at http://www.staffordmall.com/rehomeingrescue.htm or our main Stafford rescue page at http://www.staffordshirebullterrierrescue.org/index.html for new listings. Breed Specific Legislation (BSL), the lazy politician's simple-minded solution to a complex human/canine problem, has never worked and never will work. Get the real skinny at... Written in Stone. Limited supply of Steve Stone's book "Celebrating Staffordshire Bull Terriers" still available here. Go here to read more and order your copy. This book is no longer in print and we have brand new copies available.